Visit the capital and largest city in Chile and discover its local charm. European atmosphere, the passionate tango, superb cuisine and a shopper's paradise, Buenos Aires offers you many unforgettable highlights. • Trekking to Machu Picchu • Porters and all meals • Incredible scenery • Ancient ruins • Aguas Calientes Market On this four day hike along the famous Inca Highway you'll enjoy stunning mountain and cloud forest scenery and explore ruins dating back to Inca times. Take advantage of Air New Zealand’s non-stop service from Auckland to Buenos Aires. • Cuzco • Sacred Valley of the Incas • The Lost City of Machu Picchu • Pisac Markets • Ollantaytambo Fortress • Sacsayhuaman An ideal introduction to Cuzco and Machu Picchu and the delightful Sacred Valley of the Incas. • The Pantanal wetland • Wildlife • Ecolodge The Pantanal is the largest continuous wetland on the planet, containing elements of the Amazon forest, the Caatinga, the Brazilian Savannah, the Atlantic Rainforest and the Paraguayan Chaco. Bolivia is a fascinating country rich in culture and history. Explore South America's southern frontier, Patagonia, a vast, beautiful and remote land. Discover some of the world's most out-of-this-world landscapes in Northern Chile and Bolivia. This land-based Galapagos adventure offers a mixture of wildlife, marine activities and great food while staying at boutique hotels. The "El Transcantabrico" route starts in Santiago de Compostela, a magnificent city in the northwest corner of Spain and takes you on an eight day luxury train trip to the town of Leon. The journey will take you 1000 kilometres along the Cantabric coast from Galicia to the Basque country through steep cliffs, mountains, sandy beaches and extensive wetlands. The route passes by the small fishing towns of Ribadeo and Cudillero, Oviedo, Gijon, Picos da Europa National Park, Covadonga Sanctuary, Llanes, the canyon of La Hermida, Santo Toribio de Liebana, Santillana del Mar, Altamira Caves, Santander, Laredo with a ferry excursion to Santona, and Bilbao with the famous Guggenheim museum designed by Frank Gehry. Whether you intend to take off for Carnival in Rio or a trek through the Andes, this diverse and effervescent continent will enchant and invigorate. Pack a ton of adventure into one action-packed week. 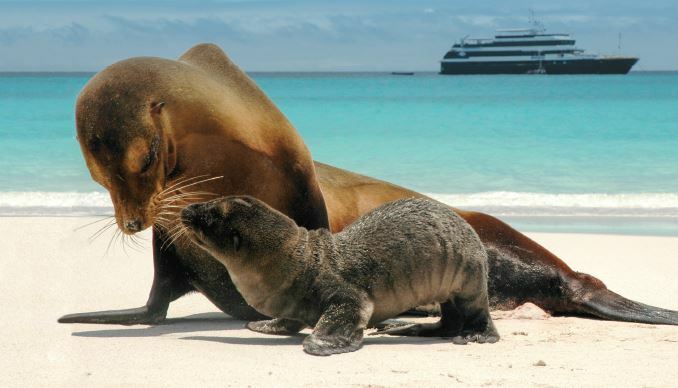 Cruise from Baltra visiting Isla Santa Cruz and a careful selection of diverse islands in Galapagos. Each itinerary offers an optimal balance of wildlife, landscape and experiences. • Buenos Aires • Iguazu Falls • Rio de Janeiro • Lima • Cuzco & the Sacred Valley • Machu Picchu, Lost City of the Incas • Lake Titicaca South America is simply magical, overflowing with ancient history and packed with culture. On this journey through Argentina, Peru and Brazil, you'll tick off most of the must see sights. Experience the very best of enchanting Ecuador, staying at the luxury Casa Gangotena Hotel in the heart of historic Quito to discover this gem of a city. Book by 30 June and save $4,940 per couple on select 2019 departures to the Galápagos Islands aboard National Geographic Endeavour II and National Geographic Islander. With these Fly, Cruise & Stay packages everything is included from Auckland, so all you have to do is sit back & relax!